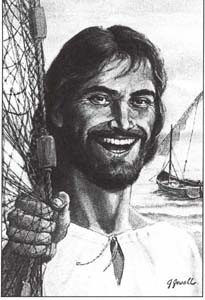 Did Jesus ever Smile? Did He have a Sense of Humor? Was Jesus the Jerry Seinfeld of his day? Not really. His ministry on earth—to announce the Kingdom of God—was more important than being a stand-up comic or poking fun at surly soup vendors. Not that there’s anything wrong with that. On the other hand, the prevailing image of Jesus as the grumpy, dour, depressed prude who spent most of his life suffering is inaccurate. When you look carefully at the Gospels, you find a man with an obvious joie de vivre, a preacher who told funny stories to make a point, a leader who gave his disciples nicknames and a former carpenter who enjoyed a good joke. So why do we often think of Jesus as gloomy, and why do all those statues, paintings and mosaics portray him as downcast? For one thing, it’s a reflection of the historical emphasis on the Passion and Death of Jesus. For the early Christians, the fact that Jesus was arrested, tried, tortured and crucified was appalling and confusing. So the Gospel writers (Matthew, Mark, Luke and John) took care to explain this period of Jesus’s life, at great length, to help the early Christians make sense of what transpired before the Resurrection. But as a result, those passages tended to dominate the rest of the Gospels. To read this whole article in the Wall Street Journal, click HERE. Pope Calls for “Central World Bank”? Read the full article HERE to see why the Vatican has not done what the media is trying to tell us it did. The media loves to twist the Vatican’s words to suit their own purposes and to be sensational. One should read the document in context and in the manner it which it was written and to be received. Ignatius Press’s Carl Olson weighs in well HERE.